Our professional One-Man Casino-Style Craps Table (#CT-1430) is built with the finest craftsmanship. 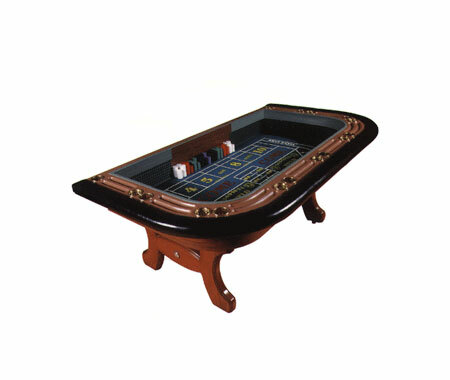 The Craps Table's interior and H-style legs are made of smooth Mahogany color wood. Each One-Man Craps Table features a billiard cloth layout, a rail rubber lined interior, a wooden chip rail, a drink rail, brass drink holders, and ashtrays. The Crap Table is 87" Long, 50" Wide, 38/39" High, and 11" Deep. For additional information on our One-Man Casino Style Crap Table (#CT-1430), please contact us at 1-800-233-0828. You might also be interested in our Casino Style Craps Table with H-Style Legs, and our wide selection of Craps Supplies, including Razor Edge Casino-Quality Craps Dice.